Since this month is Adopt a Senior Pet Month, in honor of our sister Allie (who's SO old), we asked Mommy to make a Top Five Reasons list on why Senior Cats are better to adopt. What? Just like that? Not even a David Letterman Countdown or anything??? Meet Snowball (he wants you to know he is really glad we didn't choose a name that was too awful, like Powder Puff, but he'd prefer Macho Man or King of the Jungle. Just meowin'). Snowball came to Wayside from a rural Missouri rescue group. After having spent most of his young adult years outdoors, he's ready to try the cushy life. And he's been practicing hard at Wayside. He's the current kitty crush for a lot of the peeps there who have had a taste of his mancat lovin'. And what about Sissy and Sassy, two gorgeous 8 year old sisters needing a new home. It just about broke their owner's heart to have to give them up. We think it'd be a wonderful gift to them - and to their former owner - if these senior girls were given a forever home for the holidays, don't you? 1. They're not bratty like Faraday. 2. They won't ricochet off your forehead at 2 in the morning. 3. They (usually) won't chew your favorite set of ipod earbuds. 5. They come already vaccinated and "fixed" - and often even microchipped! Have a super Sunday. We hope the darlings find a forever home soon. 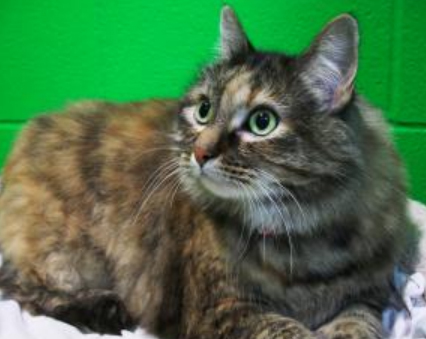 We'll be purring Puffball (heehee) and the girls have a home in time for Christmas! Hi Allie, Maxwell and Faraday! We have our paws crossed for Snowball, Sissy and Sassy. Yes, homes for the holidays would be the BEST! All good reasons and we should know: 3 out of our 4 cats are seniors. FURRY good reasons say´s my mom-person ! We think older cats also blend into the family better...our Sylvester was eight when Daddy brought him home and by the next day it was like he'd always lived with us. Regarding #2 - they won't ricochet off your forehead at 2 in the morning. Binga and Boodie are 12 and 11 respectively, and that HAS happened occasionally here. Only it is more like 5 in the morning, since my human is often just crawling into bed around 2 a.m. So don't think life with senior kitties is boring! It is pretty fun. Depending on your idea of fun. Shhh! MOL! Actually Ryker went a little crazypants from time to time when he was 13 too :-) FUN is right! We found you, our Mom is so daft. She finally figured out what your blog was Faraday. Those senior cats are good looking. I wish I had a lot of money and could just gather up the senior cats everywhere. It is so sad for them all to be in shelters. Tell Mom thanks for the items for the auction and we promise not to auction off Faraday. ALLIE IS NOT OLD!!! I'm gonna celebrate my 7th Gotcha Day soon and I'M NOT OLD! I'm just meowin. Allie: You tell 'em sister!! allie - dont listen to them... pfft! What a lovely post! And that's a great set of reasons! OMC - that kitty is so sweet and bootiful. I do hope she/he finds a good home soon. We so love the seniors and they deserve a happy, each of them. Senior pets are the best! 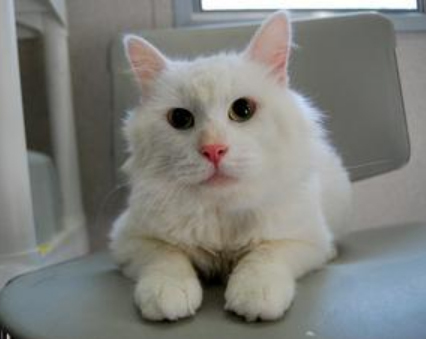 And Mama thinks Snowball is just regal looking! 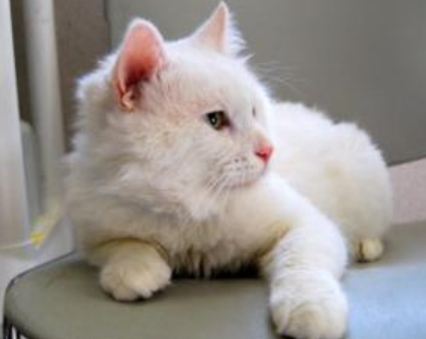 Sissy, Sassy and Snowball are gorgeous felines. BTW, my BFF, Savannah of Savannah's Paw Tracks was adopted at 9 years young! Allie: Jet, THANk you! Someone's got to put that brat in his place. seriously! Oh, we are purring they find a home soon! There is another reason to adopt them too. #7 - They still have lots of years left! The mom took in a cat when he was 10 and he lived until he was 18. Best blog I ever read. My mommy has a tender heart for senior kitties and the ones you featured here have gone straight to her heart. Mom says Snowball is her boyfriend, she is madly in love with him. We think he looks pretty handsome, but we don't want anymore animals in the home!!! Good luck to Snowball, Sissy & Sassy. 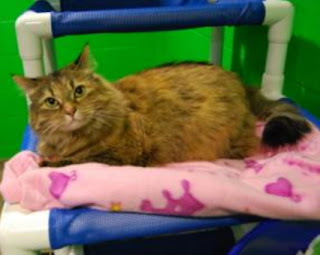 We hope they find their purrfect forever home soon! These kitties are ADORABLE and we are purring they get a wonderful furever home very soon. P.S. Allie, This 8 year-old thinks you are a hot young babe! Sound like great reasons to us! I hope Snowball , Sissy and Sassy will find their forever home soon. #3, oh they so totally will.. Such lovely kitties. I do hope they find homes for the holidays. We agree that senior kitties are great. Humans love the new senior kitty Surfeit, he's a sweetie. Purrrrrrrrrrrrrrs.